I’m kind of surprised Hollywood hasn’t remade “Breaker! Breaker!” by now with….oh, Mark Wahlberg or Dwayne Johnson. Considering the movie is subpar Chuck Norris, it would probably star someone like Charlie Hunnam or Jai Courtney, two actors studios have been trying ever so hard to convince us of their “it” status. The thing is, there’s potential here to turn this flimsy material around and make it something better than the original – that’s why you remake something Hollywood, not just for a money grab – but, it’d be a waste of money and resources, since this bland and generic movie should only be seen on an episode of “Mystery Science Theatre 3000”. Norris stars as sensitive and soulful Southern California martial arts trucker, John David “J.D.” Dawes, who early in the movie reunites with his little brother, Billy (Michael Augenstein) and for some reason lets him get behind the wheel of his 18-wheeler (named Candy-Jo and we never find out why) to deliver a load of TV dinners (that’s what you called frozen dinners back then). When his brother gets fooled into a detour that leads him into a studio backlot town named Texas City, California, run by corrupt Judge Joshua Trimmings (George Murdock) and police Sgt. Strode (Don Gentry), where he’s beaten up and his rig hauled away, it’s up to J.D. to get in there and save his hide. J.D. gets some assistance from his trucker buddy, Burton (the late Jack Nance, who was in every David Lynch film until his death in 1996) and the Judge’s resentful daughter-in-law, Arlene (Terry O’Connor), but he must kick and pummel his way through a town of hillbilly extras before he’s able to rescue his little brother. And you can guess how it all turns out, especially if you’ve seen any assortment of the “loner faces off against corrupt small-town” type movies. This is a whole lot of cheesy hot garbage attempting to come across as an entertaining drive-in flick. 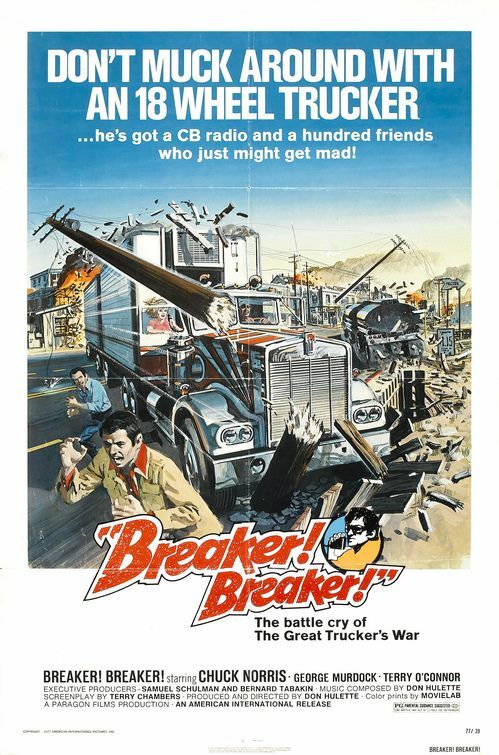 Maybe back in 1977, when the smell of weed was prevalent at the drive-in, but thirty-years later, the awfulness of “Breaker! Breaker!” isn’t even funny. 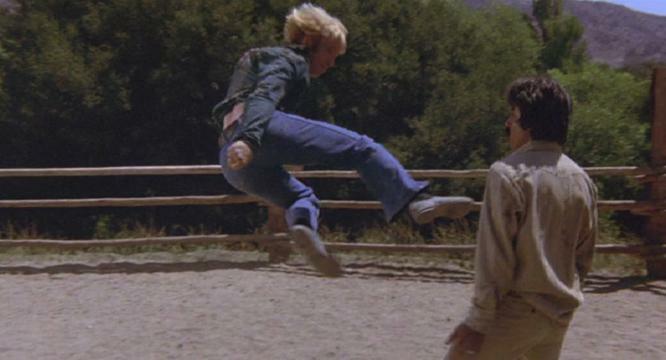 I’m no Chuck Norris aficionado, but I know he has a place in pop culture, especially over the past decade or so where we’ve witnessed this tongue-in-check-yet-bizarre deification of Chuck Norris. Granted it’s mostly people laughing at him and not with him, seeing as how incredible it is that he’s made an acting career out of high-kicks and cardboard delivery – which is exactly what you get here in one of his first lead roles. There’s really nothing to recommend here, but if you’re a Chuck Norris loyalist, I’m sure you’ll find something to defend the hairy-chested man with tight blue jeans and brown boots. Of the action scenes, I kind of got a kick out of (pun intended) a standoff in a junkyard (where for some reason one of the Judge’s overseeing goons has access to a copter) and the final fight in a corral where J.D. goes up against one of the bad cops (who brandishes a broken bottle of Wild Turkey he just finished before the fight) while a nearby horse mimics Chuck’s moves. 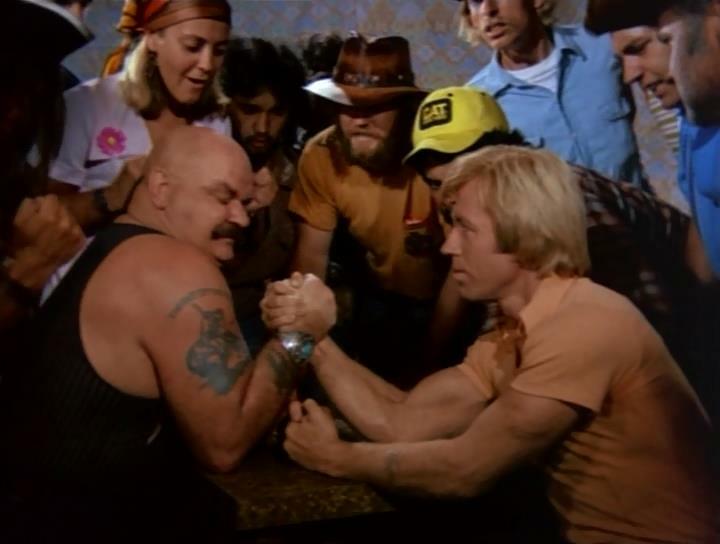 That’s about it as far as memorable fight sequences – wait, there’s also a hillbilly who comes after Chuck with a pitchfork with the threat, “I’m gonna stick ya!” – but there’s also plenty of destruction by careening big rigs – so, a little something for every truckin’ lovin’ fan. 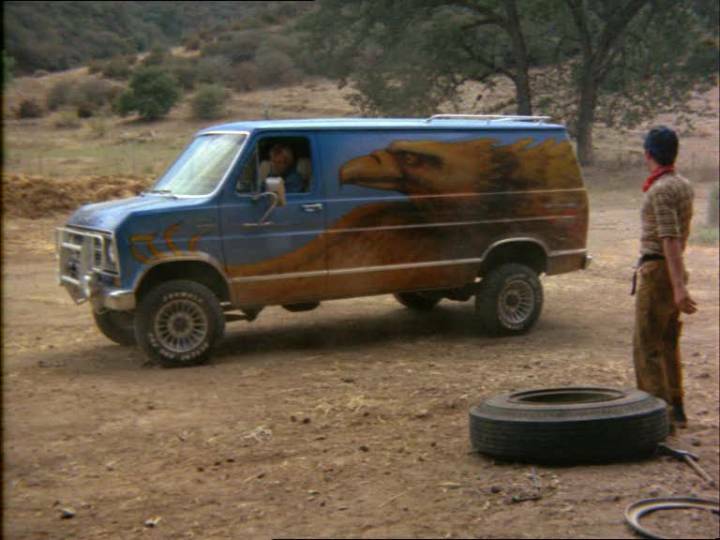 Speaking of which, for a trucker flick, it’s kind of strange that the main vehicle we see Chuck drive is a souped-up van with a bald eagle painting on each side, as if it was the character’s spirit animal. There are a couple scenes that made me chuckle, yet I’d wager that wasn’t the intention of director Don Hulette. There’s the scene where Chuck and Jack Nance are sitting at a truck stop restaurant, eating salads. That’s right, two truckers in the late 70’s…eating salads. There’s also an odd/silly scene where Chuck first meets Terry O’Connor’s Arlene and the two go for a montage stroll around her house, supposedly nestled in the California hills, yet once again feeling like a backlot construct, all to the tune of some cringeworthy easy-going song sung by Denny Brooks (who? I don’t know either). “Breaker! Breaker!” was written by Terry Chambers, as the second of three screenplays he wrote in his career, to be followed by a 1995 Skinamax flick starring Shannon Tweed. There were two big surprises I learned while studying up of “Breaker! Breaker!” One of which was finding out that Don Hulette – who made his directorial debut here at age 40 – also composed seven of Harold Lloyd’s silent films that were rereleased in 1974. I can only assume the music for those movies is better than the twangy, banjo-centric soundtrack Hulette composed for this movie. The other was discovering that the movie was editing by Steve Zaillian, who went on to write Oscar nominated screenplays (of which he won for “Schindler’s List”) and become a director as well. You gotta start somewhere, as the saying goes. 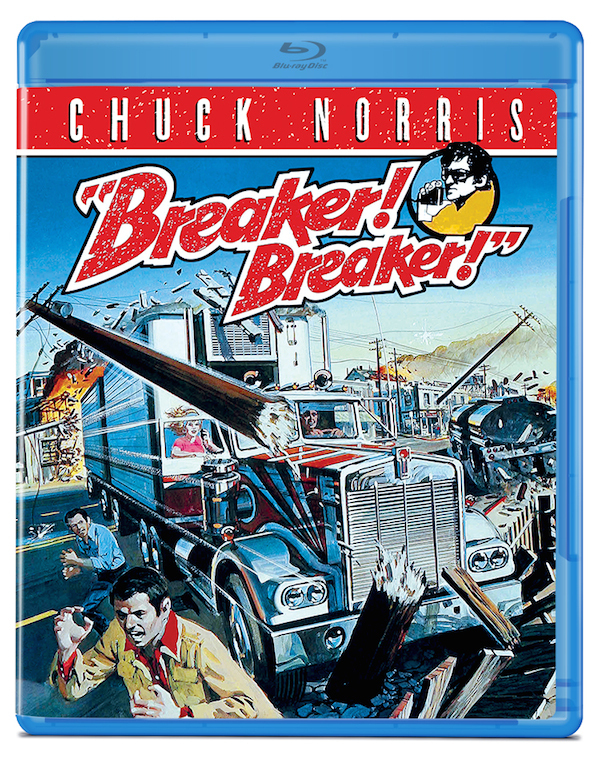 Olive Films has released this rated PG trucker flick on blu-ray for the first time in their traditional bare bones approach with a static title menu that consists of: play, chapters and trailer. While I’ve never seen the movie before, I’ll admit the blu-ray is a mostly clean and clear copy with decent color value. Unfortunately, there are no audio options, so you won’t be able to watch the movie in Spanish or French, just for kicks (oops, I did it again). Overall, “Breaker! Breaker!” feels as good as any late late late night television programming I grew up with back in the 80s, complete with horrible acting and a yawn-inducing plot. It’s a dated, basic and predictable movie that’s really only for die-hard Chuck Norris fans and devotees of this subgenre in the action/adventure department. I loved all of the 70’s CB Radio flicks. My Ex-wife & I saw just about all of them in drive-in theaters in NE Ark in Paragould & Pocahontas. I have a couple of them saved on my computer, but it’s time for me to buy this one now.